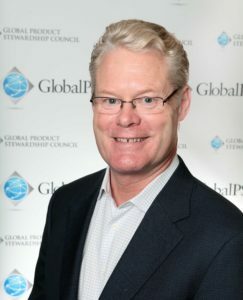 The Global Product Stewardship Council periodically invites thought leaders on product stewardship and producer responsibility to contribute guest blogs. Our guest blogger for this post is John Lingelbach, Executive Director of SERI. It has been a big year for the R2 program. Much has been accomplished – especially for a program in only its fourth year and which employs just four people. Over the past year, one of the most significant accomplishments has been the organizational transition from R2 Solutions to SERI. We made this change so we could engage in a broader set of activities that are in line with our mission of promoting safe and sustainable electronics reuse and recycling throughout the world – particularly in Asia, Latin America, India, and Africa, where access to safe repair and recycling facilities has not kept pace with the rapidly expanding use of electronics. One of the ways that we can expedite the work that needs to be done is to work collaboratively with others who share SERI’s goals. To that end, we established the R2 Leader program. In just a few short months, over a dozen corporations and organizations have joined. As part of the program each R2 Leader has identified steps they will take to promote safe and sustainable electronics reuse and recycling somewhere in the world. It is encouraging to see the energy and resources going into some of these efforts. For example, DirecTV is providing training in a number of Latin American countries. Other Leaders, such as Xerox and Goodwill, have taken steps to support and expand the collection of used electronics. A number of other projects in early stages of development will improve the electronics reuse and recycling landscape in various regions of the world. On another front, we have just completed the transition from the original R2:2008 Standard to R2:2013. The new version of the Standard has a deep emphasis on quality and consistency, with new environmental health and safety planning, record keeping and documentation review requirements. Nearly 90% of all R2:2008 certified facilities upgraded to R2:2013. Perhaps the most important SERI initiative this year is the development and initial implementation of SERI’s R2 Quality Program. Nothing is more critical to SERI’s work than the integrity of the R2 program, and nothing presents a greater set of challenges. Promoting consistency within the auditing community, and a solid understanding among facilities getting certified, is essential. Identifying and removing any bad actors is even more important. SERI is absolutely committed to doing everything in its means to maintain and enhance the overall quality of the R2 program. 2014 was a pivotal and transformative year for SERI and for the R2 Standard. Spring boarding from the momentum of the past year, SERI is well positioned to make considerable progress in advancing the cause of safe and sustainable repair and recycling around the world in the upcoming year as well as years to come. The views expressed do not necessarily reflect those of the Global Product Stewardship Council. John Lingelbach is the Executive Director of SERI – Sustainable Electronics Recycling International, formerly known as R2 Solutions. SERI is the nonprofit organization that administers and educates people about the R2 Standard and Certification Program. Mr. Lingelbach has served as Executive Director, as well as on the organization’s Board of Directors, since its inception, and previously in these capacities for R2 Solutions since its inception in 2010. From 2006 to 2009, he managed the United States Environmental Protection Agency’s development of the R2 Standard. Mr. Lingelbach is an attorney from the United States who has focused throughout his professional career on matters relating to innovations in environmental law and policy. Mr. Lingelbach received his Juris Doctorate from the University of Virginia School of law.